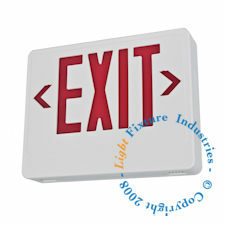 We are pleased to announce a new, economical LED exit sign with remote head capability from Light Fixture Industries. This exit sign unit is capable of powering remote heads with up to 10.8 watts of total output. Designed with the ever-changing regional and local codes in mind, this fixture complies with the latest codes and performance standards including UL924. This LED exit sign features an injection-molded, high impact, UV-stabilized, UL 94 V-O thermoplastic case with snap-together construction and a universal mounting quick-connect mounting canopy to speed up installation. The unit comes standard in white housing with optional black housing available. The long life, energy saving LED lamps provide years of reliable service. The dual voltage 120V/277V operation and UL listing for damp locations makes this fixture an ideal choice for interior residential, commercial or industrial installations. The two maintenance-free, 6V 4.5AH sealed lead-acid batteries provide up to 90 minutes of emergency power to the LED exit sign and up to 10.8 watts of remote head emergency lighting. A status indicator light and test switch for the rechargeable emergency batteries is located conveniently on the lower left corner of the unit. This fixture also includes universal single/double face and is available in Red or Green. The two chevron directional indicators can be adjusted in the field to accommodate multiple installation scenarios. The flexibility and multifunction capabilities of this energy saving LED fixture is sure to make it one of our most popular lighted LED exit signs!